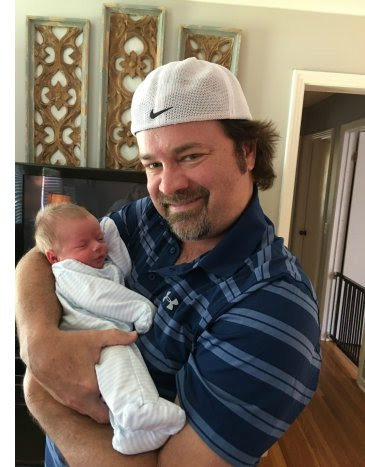 Nashville, Tenn. (June 30, 2016) - Country music group Restless Heart lead singer Larry Stewart has announced the birth of his first grandchild. Stewart's daughter, Brittany Morgan, gave birth to Caden Stewart Morgan on June 5, 2016 at 9:42 PM. "Who knew being a 'Big Poppa' could be so stinking cool?" says Stewart. "Hold em, love em, hand em back! I got this. He was six weeks early but baby, momma, daddy and grandparents are all doing well!" Stewart adds, "P.S. we are a little late with the news. My publicist kept hounding me for a pic but I've been lovin' on my grand baby and it kept slipping my mind! My bad! Here he is, y'all!" Stewart's grandson was delivered at Saint Thomas Hospital in Nashville, weighing in at 5 pounds, 7 ounces. Restless Heart recently released a new single dedicated to country great, Glen Campbell. "Wichita Lineman" is available for download now at Amazon.com and iTunes. Stewart also has a track on the newly released Voices: Vintage Hymns with Heart & Soul album. In addition to Stewart, the collection of hymns includes songs from Larry Gatlin & the Gatlin Brothers, members of The Oak Ridge Boys, Michael English, Phil Keaggy and more. The album is available for download now at Amazon.com, iTunes and Google Play.